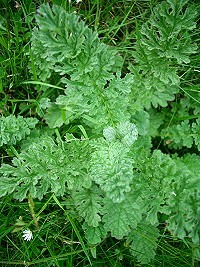 Ragwort is a common weed in pastures, roadsides and wasteland. It is poisonous to cattle, horses and rabbits. 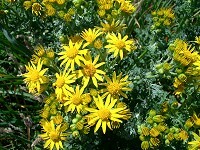 The daisy-like, yellow flowers are about 1 - 2 cms diameter and grow in large flat clusters on the stem. The leaves are feathery, deeply divided and grow in clumps. Ragwort is used in herbal medicine to treat skin inflammation, ulcers and gout.